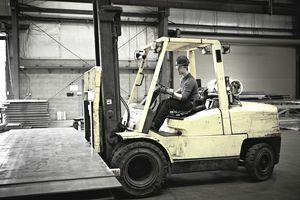 The forklift truck has been around for a century, but today it is found in every warehouse operation around the world. There are seven classes of forklifts, and each forklift operator must be certified to use each class of truck that they'll operate. Classification depends on factors such as applications, fuel options, and features of the forklift. Knowing the difference between them can help you decide on which one to get, whether you decide to lease, rent or buy your next forklift. These forklifts can be equipped with either cushion or pneumatic tires. The cushion-tired lift trucks are intended for indoor use on smooth floors. The pneumatic-tired models can be used in dry, outdoor applications. These vehicles are powered by industrial batteries and use transistor motor controllers to control travel and hoist functions. They're very versatile and are found from the loading dock to the storage facility. They're generally used in applications where air quality needs to be considered. This forklift is for companies that opt for very narrow aisle operation. This allows them to maximize the use of storage space. These vehicles have unique features that are designed to minimize the space occupied by the truck and to improve speed and efficiency. These are hand-controlled forklifts, meaning the operator is in front of the truck and controls the lift through a steering tiller. All controls are mounted on the top of the tiller, and the operator moves the tiller from side to side to steer the truck. These vehicles are battery powered, and the smaller capacity units use industrial batteries. These forklifts are used inside on smooth dry floors for transporting palletized loads to and from the loading dock and the storage area. The cushion-tired forklifts are lower to the ground than forklift trucks with pneumatic tires. Because of that, these forklift trucks can be useful in low-clearance applications. These trucks are most commonly seen in warehouses. They can be used either inside or outside for virtually any type of application. Because of the large capacity range of this series of lift truck, they can be found handling small single pallet loads to loaded 40-foot containers. These lift trucks can be powered by internal combustion engines and are available for use with LPG, gasoline, diesel, and compressed natural gas fuel systems. These vehicles are versatile and can be used in a variety of applications. They can be equipped with either internal combustion engines for outdoor use or battery powered electric motors for indoor use. Rough terrain forklifts are fitted with large floatation tires for outdoor use on difficult surfaces. They're often used at construction sites to transport and lift building materials to various job site locations. They're also common with lumber yards and auto recyclers.